ABB leapt into the collaborative robotics space at the Hannover Messe trade show by launching their two-armed YuMi robot and simultaneously announcing their acquisition of German startup gomTec whose one-armed co-bot was a hit at last years AUTOMATICA. Lightweight flexible robot arms that are innexpensive and safe to work alongside human workers are one of the hottest topics in industrial robotics today. Manufacturers are being called upon to deliver complex solutions with tiny components requiring assembly. Millions of workers, across thousands of assembly lines, have heretofore built these electronic products upon which the world has come to depend. Explosive growth, extremely short life cycles, rising demand for higher pay and better quality of life among workers, has shown that the current system is neither scalable, sustainable nor a solution for these new facts of life. Rodney Brooks has been an eloquent proponent of collaborative robotics as a solution - and also opening new markets to robotics, i.e., SMEs - and has actively marketed these concepts and technologies as well as his company's Rethink Robotics Baxter and new Sawyer robots. Rethink and Danish Universal Robots have literally created this new co-bot marketplace with their safe, low-cost robots and have done so without competition from the big robotic vendors. Consequently their sales have soared, particularly Universal Robots' sales. But that vacuum is rapidly changing and ABB is the first of what may be many examples. 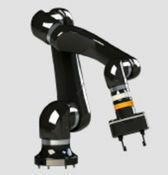 ABB has been working on their two-armed YuMi robot since 2006. They officially launched it at this year's Hannover Messe trade show on April 13th. YuMi has vision, sensitive force control feedback, built-in safety features, and training and programming methods by teaching rather than coding. YuMi is designed to be flexible, portable and low cost with a selling price beginning at $40,000; not as low as either Universal or Rethink, but low nevertheless. 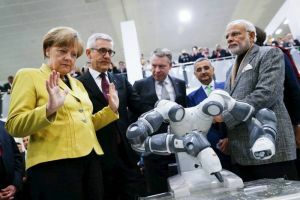 ABB Chief Executive Officer Ulrich Spiesshofer said the company has received its first orders for YuMi immediately following its demonstration to German Chancellor Angela Merkel and India's Prime Minister Narendra Modi at the show. Spiesshofer said customers were energized by the possibilities offered by a robot engineered to work safely side-by-side with people without protective cages. YuMi is so precise, he said, it can maneuver a thread through the eye of a needle, an attribute particularly prized in small assembly including the electronics industry where accuracy and flexibility are in demand. gomTec's lightweight inexpensive 6-axis modular one-armed Roberta robot was demonstrated in Munich last year at AUTOMATICA. Pricing then was between $40K and $46K but at today's conversion rates are $30K to $35K. The range is due to the modules chosen by the client: grippers, grippers with integrated cameras; force torque sensor; etc. I can’t help but admire ABB’s swift business decision to acquire GomTec. With YuMi for handling small parts and the Roberta family of collaborative robot arms for larger payloads, ABB suddenly became a major player in the field of collaborative robots and a direct competitor to Universal Robots. In 2013, Kuka quietly brought to market their co-bot which they called the LBR iiwa. LBR stands for “Leichtbauroboter” (German for lightweight robot), iiwa for “intelligent industrial work assistant”. At AUTOMATICA 2014 Kuka started to promote it with a huge separate booth just for the iiwa. Interestingly, gomTec's founder Bernd Gombert worked at DLR as a researcher from 1989 to 2001 where one of his projects was the development of the robot now known and marketed as Kuka’s LBR iiwa. One thing that both co-bot manufacturers Universal and Rethink found out from feedback from their users was that users wanted robots that had more precision but also a smaller footprint so they could be used for intricate assemblies. Both companies responded. Universal Robots' UR3 is light and nimble and costs $23,000. The UR3 reflects three years of development to miniaturize and improve their technology which was already compact and integrated. The new UR3 - which is available for purchase now - has improved force control, modular design, and faster boot-up. It can fit in an assembly line but it is not meant to do intricate assembly work. Rethink announced their new small footprint single-arm robot which they named Sawyer last month with an in-depth article in IEEE/Spectrum. Sawyer is designed primarily for precise, repetitive tasks, specifically those that take place in the middle of a long assembly line of electronics products. Baxter is too big to meet that requirement. Rethink will integrate a Harmonic Drive into each of Sawyer's joints to help eliminate backlash. That, plus some other adjustments, makes Sawyer more precise than Baxter. Sawyer will sell for $29,000 and be available later this year. It is presently being field tested by a few U.S. manufacturers. YuMi, Sawyer and the UR3 are all trainable without coding, are quick to set up, and don't require extra costly precautions. Universal has set up a 200-strong global integrator / distributor network and 2014 was a banner year for sales and revenue; Rethink is starting to ramp up their sales network. However, ABB already has a mighty global network of integrator/distributors well-versed in robotics and as can be seen in the video links below, ABB is focusing YuMi as a solution to intricate electronics manufacturing. ABB is the second of the Big Four robot manufacturers (Kuka, ABB, Yaskawa Motoman and Fanuc) to solidly hit the marketplace with a well-priced, solidly-built, and well-backed robot. Kuka's LBR iiwa robot is, at present, too pricey. With the acquisition of gomTec, ABB will very shortly be able to offer manufacturers a low-cost, plug and play, single- and dual-armed, collaborative electronics assembly robot. Although I have only written about YuMi, Sawyer, UR3 and LBR iiwa, there are other vendors in the co-bot marketplace, however they are either not offering a comparable price or haven't actually begun to sell just yet. They are for a future article. Here are links to product videos for the other robots mentioned in this article.